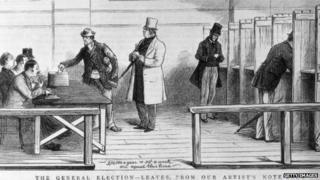 Image caption A newspaper sketch of the general elections of 1880, with the caption "30,000 a year and 30 shillings a week are equal this time"
When the UK goes to the polls on 7 May votes will be cast through a secret ballot. But it was not always thus. Elections used to be altogether more public and dangerous affairs. So much so that, when the UK's first secret election was held in Pontefract, West Yorkshire, people complained it had taken all of the life out of it. Until the Ballot Act was passed in 1872, voters had declared their candidate openly, leading to drunken fights, intimidation and bribery. All that changed when Hugh Childers was elected MP in a contest The Times described as "throughout peaceful". It was the first time people had voted in secret by placing an "X" on a ballot paper next to the name of their choice - the system we now take for granted. That simple double-stroke of the pencil helped put an end to the drinking, partying, bribery and violence that made up the average Victorian election. Deciding who to vote for was previously a dilemma not just for you but for your boss at the local factory or your landlord, both of whom could see you out of your job or your house if you did not do as you were told. And it was pretty easy for them to find out who you had backed. Voting involved publicly stating your choice and your name, details that would be noted down and published in a poll book for all to see. Even if you were not beholden to your landlord or employer, you could still be swayed by the boozy parties thrown by candidates or the bribes handed out in local public buildings. And if you could not be swayed? Well, there were always threats of violence to concentrate the mind. "That was part of a broader election culture that was much more festive, more boisterous than the rather more humdrum ones we have now," said Dr Tom Crook, lecturer in modern British history at Oxford Brookes University. "There would be people boozing, drinking, partying. Parties would "soak" their supporters - basically ply them with booze - and the candidates would pay for it all, and also people who didn't have the vote could partake in this. "On polling day there would be a kind of suspension of the normal rules of society. "In 1868 in Blackburn, a Tory voter was kicked to death by a gang of Irish navvies and, although people were not often killed, there was a certain relaxation of normality." Candidates would put on dinners, breakfasts and picnics for the public. In Gloucester during parliamentary elections in 1857 and 1859 the Tory party agent gave out food and drink to local supporters and lavished funds on Tory voters who acted as messengers, flag-bearers and bandsmen. Less subtle bribery was commonplace too. In 1835 in Stafford, votes apparently changed hands for about £14 - £1,200 in today's money - as the contest drew to a close. It did not always take that much to buy a vote. In Beverley in Yorkshire in 1865, the Liberal candidate secured the votes of more than 400 supporters at the cost of between £1 and £4 each - about 80% of the total support he received. The bribes were distributed in the library of the local mechanics' hall, with the voters handed their money through a small hole in the library door in order to hide the face of the person paying them. John Whitaker, curator at Wakefield Museums, where the Pontefract ballot box is held, said: "You had to vote in public. If you were lucky enough to vote, you were at risk of being exposed for who you voted for. "The type of people that became MPs were landowners, businessmen and factory owners. "If you had a job in a factory run by someone who ran for government then they would know if you didn't vote for them. "So your job could be at risk, your home could be under threat - there was a social pressure to vote for certain people and the secret ballot changed all that. "Voting was said to be quite a boisterous affair and this made it a little more sombre." Across Britain there were occasional reports of voters being kidnapped, plied with alcohol and then marched to the polls with a candidate's name in their ear. In Ipswich in 1841, gangs smashed windows around the venue of the hustings and waved poles topped with the severed heads of sheep. But a lot of the practices carried on even after the passing of the Ballot Act and it was not until the Corrupt Practices Act of 1883 that change began in earnest. The act specified how much money candidates could spend during election time and banned activities like the buying of food or drink for voters. "The secret ballot was part of a broader set of regulations which changed the way Britain voted," said Dr Crook. "There was this emerging concept of the voter, similar to how we conceive them now. "You are an intellectual, you have your own opinion and you should be able to exercise it in an independent fashion." It was William Gladstone's Liberal government that brought in the changes, in the face of considerable opposition. After all, the public liked the parties and the bribes and the candidates liked getting voted in. "One argument against secrecy was that it was only right for people to vote in an open fashion because that was the responsible thing to do," said Dr Crook. "If you're a strong, independent person you should be able to say who you voted for and why, and MPs voted in Parliament in public and many thought electors should be subject to that. "We take it for granted now, but in the mid-Victorian period, people like a landlord thought it was quite legitimate that they should instruct people who were inferior to them how to vote." The changes were pushed through largely by Liberals who were "sick and tired" of the corruption and bribery surrounding British elections. Steven Fielding, a professor of political history at the University of Nottingham, believes allegations of vote-rigging in Tower Hamlets and clan politics in Bradford prove we did not create a perfect system. The government introduced individual electoral registration in June in an attempt to stamp out some abuses - a move Labour argues has seen a drop in young people registering. "You could argue that by trying to solve a small problem they have created a much bigger issue and disenfranchised lots of people who would otherwise have been able to vote," said Mr Fielding. Perhaps what we need, he suggests, is a return to our political past. "When you vote it's a private action but it has enormous public consequences," he said. "You might think that if people are voting secretly, then they are voting for their own selfish interests. "Would it not be worth considering voting in public again - would that be more likely to make us vote as members of our community? "Before, you couldn't police it properly to protect people from intimidation, but you could do that now. "Maybe we don't need the secret ballot any more."